I recently flipped through Martha Stewart's Encyclopedia of Crafts: An A-to-Z Guide with Detailed Instructions and Endless Inspiration. It is a beautiful book with plenty of inspiring color photos of the projects. 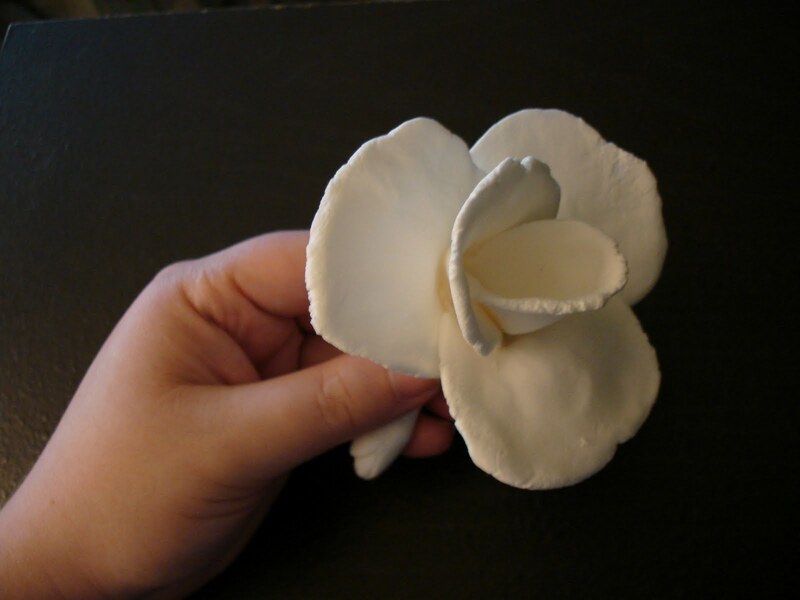 I was especially intrigued by the air-dry clay flowers the encyclopedia details; the extremely lightweight clay is perfect for hair accessories, especially to be worn in fine hair like mine. Because the book is in encyclopedia form, however, the techniques are arranged alphabetically (as in 'C is for Clay') and some of the projects did not receive as much attention as others. The section on clay describes how to recreate several varieties of flowers in the clay but the photos weren't quite large enough to clearly convey the shape of each type of petal and how to arrange them. 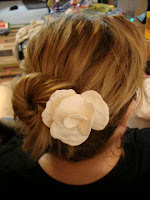 Below, I have posted the photos from my attempt to make a gardenia hair pin. Granted, I took a little creative license with the flower, especially with the number of petals; the instructional text does not include a specific number of petals for the gardenia, but in photos it looks like they have eight. Mine has six. I was more concerned with the look than with creating a perfectly realistic flower. I formed each petal out of a ball of clay about the size of a large marble. I pressed it into shape using my finger tips, then tried to smooth away any clearly visible fingerprints (see photo to the right). Although I didn't have any on hand, I think cake fondant-shaping tools would be particularly useful for working with this type of clay. When the first petal was formed, I folded it in half, forming the center. 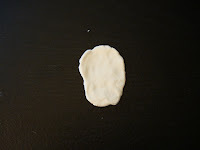 I folded the second petal around it is pictured. 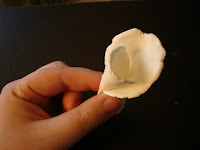 I built the flower up, petal by petal, slightly folding the petals downward to give the flower a more open appearance. Once the flower was the size and shape I wanted, I rolled the base into a rope and pinched it off about 1/2 or 3/4 of an inch from the underside of the petals. I flattened the remaining stud, then inserted an aluminum knitting needle through the base. I suspended the knitting needles between two overturned glasses and allowed it to dry for the requisite amount of time (the clay packaging will tell you exactly how long it takes for the clay to dry completely). When the flower was dry, I removed it from the needle. This left a hole through the base of the flower through which I threaded the top bar of a large bobby pin. I filled the remaining void with hot glue, ensuring that the flower would stay in place on the pin. This hair accessory is perfect for dressing up a sloppy bun (which I pretty much sport on a daily basis during the summer, especially in the St. Louis heat!). It is so incredibly light that I forget it is in my hair until I lean my head on something. The clay is also surprisingly durable -- I spent a day driving around with it in my hair, inadvertently crushing it against the head rest and it didn't break or crack. These flowers are also versatile; as Martha Stewart's Encyclopedia illustrates, there are many applications for them (gift toppers, headbands, etc.). I hope you'll give these flowers a try, and be sure to check out the Encyclopedia of Crafts -- it's worth it. Be creative and enjoy! P.S. 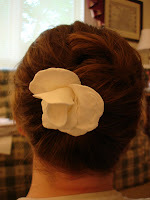 : Thank you to my beautiful sister for modeling the flower in the first picture of the post. I absolutely love this idea, I would really like to try out this idea. Thanks!! 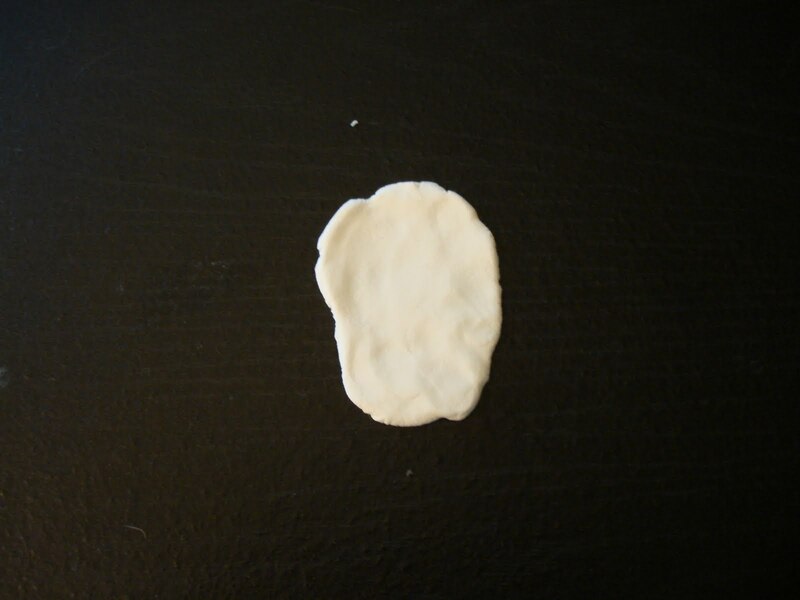 Hi, Khanh -- The brand of air dry clay I used is called Activa Hearty (in white). Here is a link to the Amazon listing so you can see what the packaging looks like, although I would shop locally first. My hobby store was selling the clay for $3.99 for the 1.75 oz package. Thanks for reading!